To book or receive more information, send an email directly to janath@nkartravelhouse.com, and be sure to say Solo Trekker 4 U sent you! Touch down in the paradise isle and hit the coast right away! Head to the party center of Negombo before you will be presented with a buzzing wilderness experience across Island – the land of the Leopard. Meanwhile, Anuradhapura and Polonnaruwa flanked by Sigiriya are guaranteed to be top tier cultural attractions in your bucket-list. Take some time to admire the heartfelt smiles of the village folk of Hiriwadunna before heading to the last Royal Capital of Sri Lanka which treasures the sacred tooth relic of Lord Buddha. Blessed with its virtues, feel free to spread your arms to the cool climes of Nuwara Eliya as your train will ‘hiss and swish’ through the heats of lush tea estates and hollow tunnels. You will also be fortunate enough to witness Horton Plains and the World’s End before you can get ‘whaled’ off the Mirissa shores where the giant-finned rise and crash into the deep blue sea. Wrapped in a blanket of memories, take some time to buy few memorabilia for your loved ones at home while you spend your last night in Colombo! Scenic Train journey through lush green mountains. On arrival at the Bandaranaike International Airport, you will get your first taste of warm Sri Lankan hospitality. A representative from NKAR Travels & Tours (Pvt) Limited will welcome you & you will be transferred to your hotel in Negombo. As the journey begins, catch glimpses of Coconut cultivation Fields and vast areas of Paddy Fields in the outskirts of the city, as well as natural & man-made reservoirs that support the agricultural industry of the village folk. You could stop on the way to freshen up with a king coconut. Arrive at the stayover hotel. Relax by the pool after a long journey. In the evening climb the Sigiriya rock fortress. This will be your first hand encounter with the natural surroundings of Sri Lanka therefore please do be adequately prepared for a warm tropical weather – especially in the north Central region of the Island where you’ll be for the next few days. After breakfast take a short drive to Magallena temple Junction from where you commence your first Trek. This first trek takes you through the remote village areas and leads you to the Magallena Temple, a temple located next to a scenic rock. 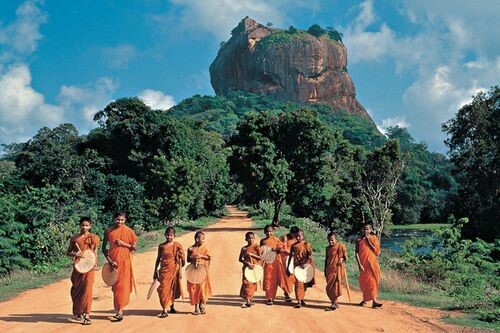 Heritage Site: Sigiriya Rock fortress as well as Pidurangala. You will have the privilege of enjoying a cup of tea at the temple after which you will continue your journey through dry farming region passing paddy fields, forest patch & man made reservoir. You will see the village life that will surround you until you reach the vehicle. In the afternoon there will be a chance to do an Optional Safari to the Minneriya National Park where you will be able to see Elephants in their natural habitat. Minneriya Park is a national park in the North Central Province of Sri Lanka. The park is a dry season feeding ground for the elephant population. Sri Lankan Leopard and Sloth bear which are rare and endangered species also inhabit this area. The park was declared as a wild life sanctuary in order to protect the watershed of Minneriya tank and the wildlife of the surrounding area. The tank is historically important for the country as it was built by King Mahasen in the 3rd century AD. After Breakfast we drive to Ranamuregama via Bakamuna for Trek from Narangamuwa Temple. The trek you start from this temple will take you through a scenic journey through the village passing paddy fields. You will be led to an isolated region through a forest patch that will bring you to a very remote village in Meemure. By this time, you would have entered the Knuckles mountain range where your trek will take you alongside streams and waterfalls with crystal clear water. The path used for this trek was once used by villagers to go from one village to the next but is now more or less a no man’s land where you will only see an occasional villager passing by if you’re lucky. You will experience breathtaking fauna and very unique bio diversity during your trek where you can enjoy a rich source of bird life and butterflies. However, since rains are a norm in the Island, there are possibilities of encountering leeches – for which you need to be adequately prepared. Dinner and Overnight stay in Knuckles. After breakfast proceed to the city of Kandy, the Hill Capital of Sri Lanka. Kandy is a popular charming hill capital of Sri Lanka is surrounded by hills, valleys, rivers, lakes and waterfalls. It is the cultural center of the island and a UNESCO heritage city. The sacred tooth relic of Lord Buddha is enshrined at the Dalada Maligawa, the temple of the tooth. to Upper lake observation point of the city and proceed for City tour by foot with walk around the Kandy Lake before checking in to your Hotel in Kandy. You can choose to spend the rest of the day at leisure or choose an optional activity: Paying a visit to the Royal Botanical Gardens where you can see around 4000 species of plants. The arts and crafts center in Kandy, the main Buddhist monasteries Malwatta and Asgiriya Monasteries are places that you can visit while you’re there too. Kandy is a great place for souvenir shopping and to learn about its rich culture and history. Later in the evening you will have the option of doing a bit of exploring on our own and maybe do your own personal shopping or maybe even go out to a local pub and enjoy a relaxing drink before returning to hotel. After Breakfast, we continue our journey uphill by taking a scenic drive to Watagoda passing through the mountainous hill country which is rich with tea plantations. The Tea plantation trek starts from Watagoda to Nanu Oya will give you the privilege of experiencing the contrast in the climate change from very warm to moderately cool. This trek will take you through proper tea plantations with beautiful views of more m ountains, tea endless tea plantations as well as tea factories. You will continue the trek until you reach the ‘Great Western’ railway station which is yet another beautiful and scenic railway station in the hill country. You will stop close to the station at a relaxing resting area where you will be able to enjoy a unique delicious lunch based on South Asian (Indian) cuisine which is available in plenty in the region. A glimpse of the Tea industry of Sri Lanka through more Tea Plantations, Factories as well as worker line rooms, tea weighing sheds and maybe some tea pluckers too. After an early breakfast you will be driven to Horton Plains to commence your Trek to World’s End. Experience the micro climatic zone of highlands at World’s End which is a high windy plateau at the elevation of 2100m from sea level consisting of beautiful grassland and cloud forests. Horton Plains National Park in Ohiya is a protected area in the central highlands of Sri Lanka and is covered by montane grassland and cloud forest. This plateau at an altitude of 2,100–2,300 meters (6,900–7,500 ft) is rich in biodiversity and many species found here are endemic to the region. Drive back to Nuwara Eliya. After Breakfast you will have a few hours to explore the city of Nuwara Eliya. Nuwara Eliya is a city in the hill country of the Central Province, Sri Lanka. The city is considered to be one of the most important locations for tea cultivation and well known for its cool climate being the coolest area in Sri Lanka. Many of the buildings have still preserved features from the colonial period. Many private homes have also maintained their old English-style lawns and gardens. The town wakes up with many activities in April for the Sinhalese and Tamil New year. Main allure during April season include the motor and horse racing events. You can visit the Race Course and even go watch the locals taking a stroll along Gregory lake or visiting Little England to shop for their Winter Clothing before an overseas trip. The best sights of Nuwara Eliya includes ‘Pidurutalagala’, the Tallest Mountain in the Island, the beautiful green of the Golf Course, the Victoria Park and which is situated in the very heart of the city as well as Colonial structures in the region including some creatively built hotels and the city’s Post Office. You will then be driven to the Nanu Oya Station to take a very Scenic Train ride to Bandarawela. This journey will take you past the Railway station of the highest elevation through misty mountains, waterfalls as well as stunning tea plantations and factories as you descend about 600m (from 1700m to 1100m from sea level). Afternoon safari at the Yala National park well known for its high density of Leopards in the region where a handful is lucky to spot the sloth bear. Yala National park is one of Sri Lanka‘s premier eco-tourism destinations and is among the oldest and best known of Sri Lanka‘s National Parks. Here you will witness the wonder of Sri Lankan Wildlife for it is a sprawling paradise of birds, reptiles, leopards and more! You will also see families of deer, wild boars as well as monkeys crashing through the trees, peacocks in their finest frocks and elephants ambling about as you go along. After breakfast proceed to Sinharaja. Reserve and World Heritage Site by UNESCO. An interesting phenomenon is that birds tend to move in mixed feeding flocks, invariably led by the fearless greater racket-tailed drongo and the noisy orange-billed babbler. Of Sri Lanka’s 26 endemic birds, the 20 rainforest species all occur here, including the elusive red- faced malkoha, green-billed coucal and Sri Lanka blue magpie. Take the local train to Galle which gives you an experience of the local transportation. The fort has a colorful history, and today has a multi-ethnic and multi-religious population. The Sri Lankan government and many Dutch people who still own some of the properties inside the fort are looking at making this one of the modern wonders of the world. The heritage value of the fort has been recognized by the UNESCO and the site has been inscribed as a cultural heritage UNESCO World Heritage Site under criteria iv, for its unique exposition of “an urban ensemble which illustrates the interaction of European architecture and South Asian traditions from the 16th to the 19th centuries.”The Galle Fort, also known as the Dutch Fort or the “Ramparts of Galle”, withstood the Boxing Day tsunami which damaged part of coastal area Galle town. It has been since restored. Transfer from Galle to Bandaranayake International Airport for the flight back home.